To describe a novel time-resolved magnetic resonance angiography (TR-MRA) postprocessing technique using the time-resolved angiography with interleaved stochastic trajectories (TWIST) method to evaluate the pulmonary veins and left atrium in adults with congenital heart disease undergoing cardiac MRI. Institutional ethics committee approved the study. 21 consecutive adult patients (14 female, 7 male patients, mean age 28 years) with known congenital heart disease who underwent a cardiac MRI were included. Post-processing of the TR-MRA sequences created novel “subtracted” datasets. Two independent observers reviewed the conventional TWIST and novel subtracted TWIST data sets in source and maximum intensity projection (MIP) coronal reformats to assess visualization of the pulmonary veins and left atrium based on a 5-point scale. Quantitative signal to noise (SNR) comparison was performed. TR-MRA yielded diagnostic image data in 20/21 patients (95.2%). 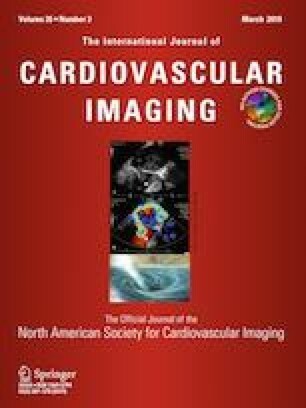 The novel “subtracted” TR-MRA technique improved visualization of the pulmonary veins and left atrium compared to the source TR-MRA sequence in 16/20 patients (mean scores 3.34 ± 0.69 vs. 2.92 ± 0.69, p < 0.008). Further improved visualization of the pulmonary veins and left atrium was observed in the subtracted MIP TWIST sequences compared to the MIP TWIST images (mean scores 4.43 ± 0.80 vs. 3.02 ± 0.87 vs., p < 0.001). No significant SNR difference between the source and novel subtracted group was observed (85.4 vs. 70.4, p = 0.57). Compared to source TR-MRA images, subtraction of TR-MRA images is a novel postprocessing technique that improves visualization of the pulmonary veins and left atrium in a substantial number of patients. The online version of this article ( https://doi.org/10.1007/s10554-019-01585-x) contains supplementary material, which is available to authorized users.